I actually had to change around my blog posts quite a bit. I had planned a few pregancy posts, pregnancy outfits, information on how to deal with maternity sickness, and so on. However, after my miscarriage last week I absolutely do not feel like posting anything pregnancy related. 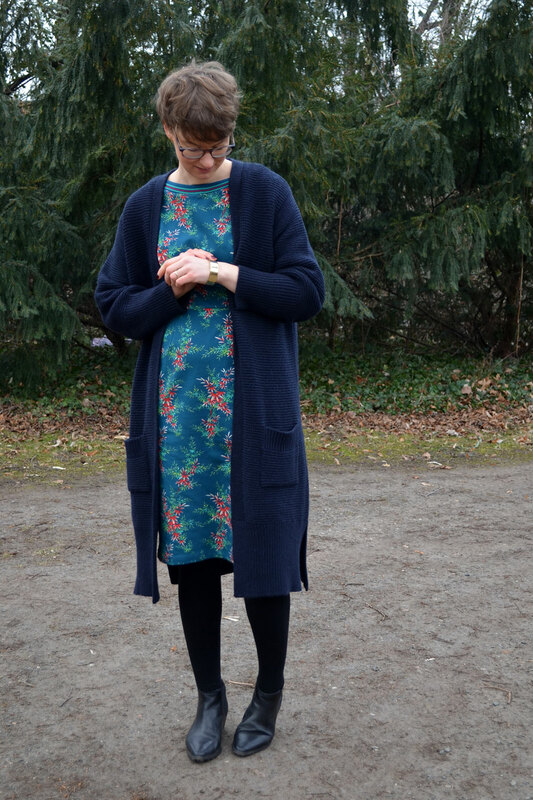 So I changed my schedule and planned a few other posts; starting with this all organic and ethical outfit! How beautiful is this dress please? So here is the thing: fair fashion labels are popping up every here and there and this is GREAT. Really great. However, most fair fashion labels are either hyper cool; like that cool that they are super minimalistic, only having black, white, and dark blue pieces in their collection – or they are hyper hippie; like that eco/hippie like that they are only having extreme colorful, batic, and so on pieces in their collection. I like both, most definetly, especially all those minimalist pieces. HOWEVER sometimes I feel like wearing something more colorful, somthing more bold, something with flowers on, and with a fun twist. 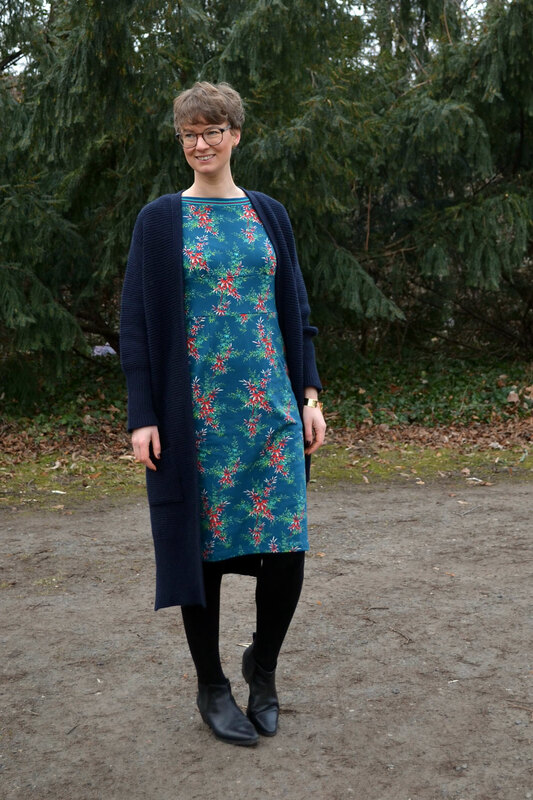 And this is why I immediatly fell in with this dress, when I first visited the HUG Berlin online shop. In the HUG online shop you can find organic and fair pieces that are not only made in a sustainble way by great labels but that are also chosen with a whole lot of love. I do not know the two owners personally but I know they have a great sense for style, by just looking at the pieces they chose for their shop. I could easily shop every second item in the clothing section and this rarely ever happens to me. 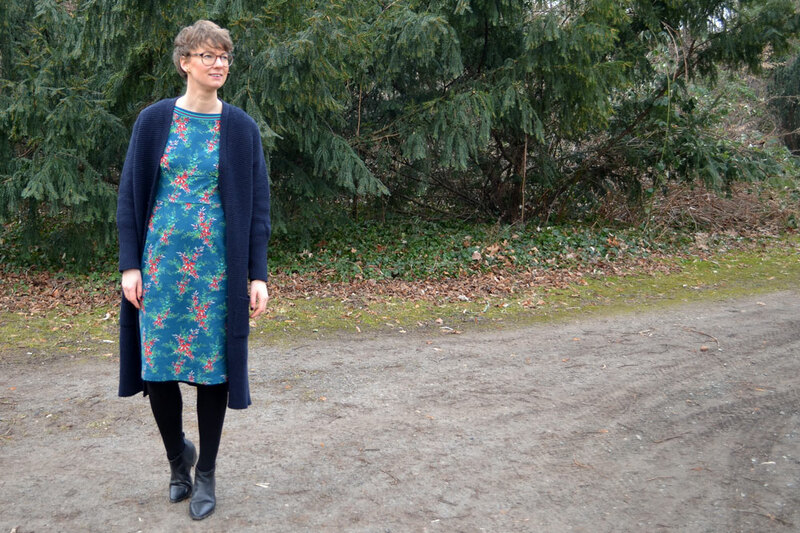 When I chose the dress and the cardigan I had my pregnancy still in mind and I thought that this dress would look so pretty with a little bump… well, the good news is that it does also look really good without baby belly! The dress is from the label King Louie that I haven’t heard of before. As far as I know, they have a conventional collection and an organic collection, but correct me if I am wrong! The cardigan is from Miss Green, another label I didn’t know. I am such a fair fashion expert, right? Not! On the other hand, I find it great when I get to know new labels through an online shop such as HUG Berlin. That’s most definetly better than when I go somewhere where I know all the labels anyway. The dress is only 80€! I find that pretty cheap for an all organic piece that is made by a label which is part of the Wear Fair Foundation! You can shop the dress here. I am wearing a size M and I am 174cm, just in case you wonder how to size. 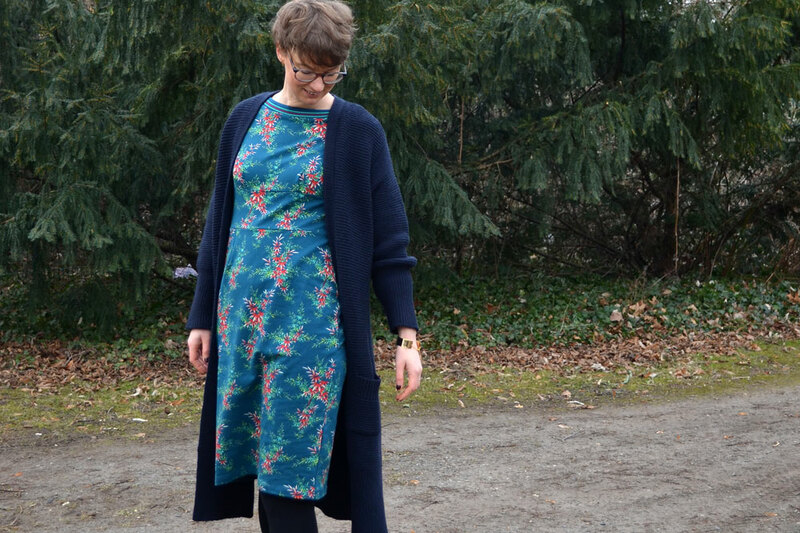 Oh and the fabric is stretchy and pretty thick so you can wear it all year round – on colder summer days with nothing else, and in spring, fall, and winter with a cardi and tights like I do here. 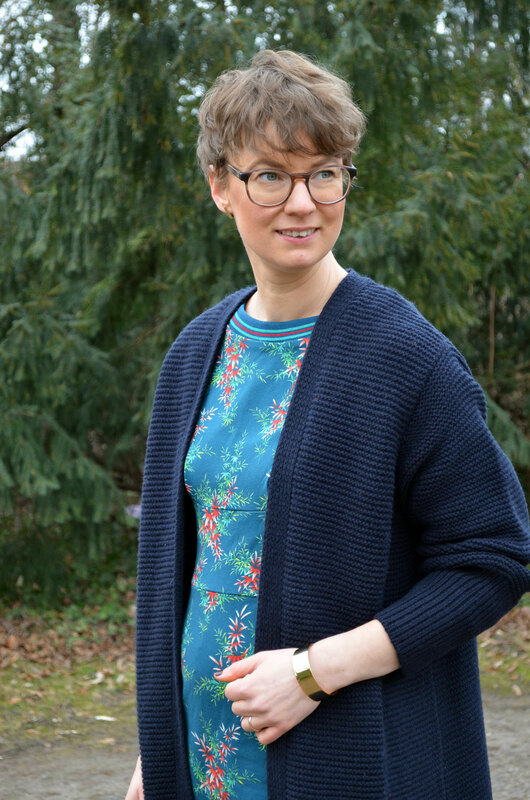 The cardigan which is probably one of the best quality cardigans I have ever owned (I feel so precious when I wear it 😀 ) is on SALE and you can find it here. 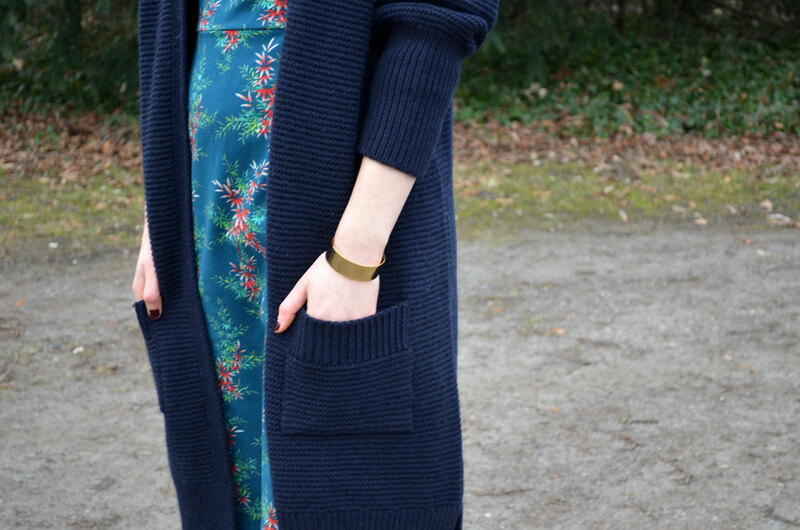 I think it is perfect for between seasons and I might wear it like a million times on the blog from now on. 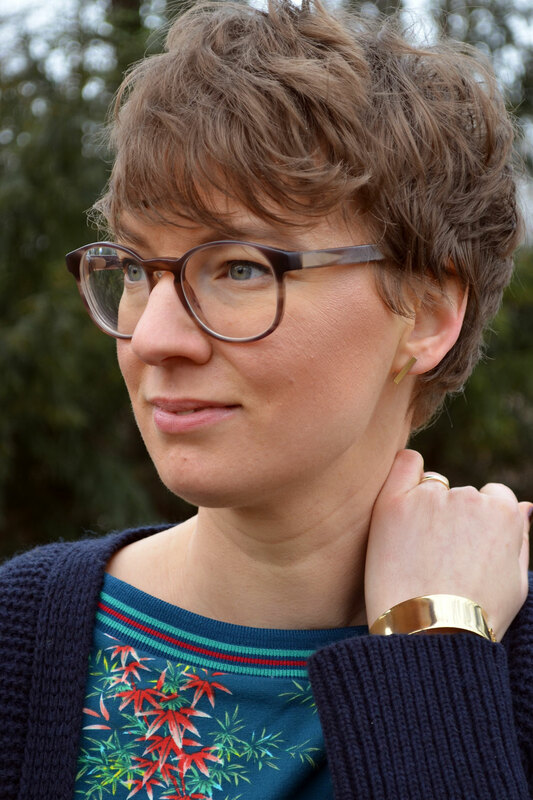 There is another little something I want to draw your attention towards to, when talking about this outfit: my bracelet cuff. I am always simple and minimalistic with my jewelery, as you might have noticed. I like simple golden pieces, some wood and geometric shapes every now and I am good. Now, finding jewelery that is made in an all sustainable way, that is ethically made, and that is beautiful can be a challenge. There are quite a few local labels that I love and that I love to support, however, finding great labels that ship internationally is another thing. So a while ago I got to learn about NOUA jewelery and I have to share their idea with you, because I know you will love it as much as I do. The great thing about NOUA is that all material used for their jewelery is recycled. The origin of the metals are existing jewelery, industrial metals, and electronic components. Also, NOUA engages in multiple internal and external actions to gauge the risk of slavery and human trafficking, and they expect their vendors to respect and adhere to the same business philosophy in the operation of their businesses. All pieces are made in Europe (London and Paris) under fair conditions, and the label also guarantees for being a cruelty free brand. All in all I find that worty of support and I think their approach is pretty exemplary. Especially the idea of using only recycled materials is SO important. I mean how can something be sustainable when children in Burkina Faso had to work deep dark underneath to get the gold for the lateron fairly produced piece of jewelery? It doesn’t really make sense, does it? 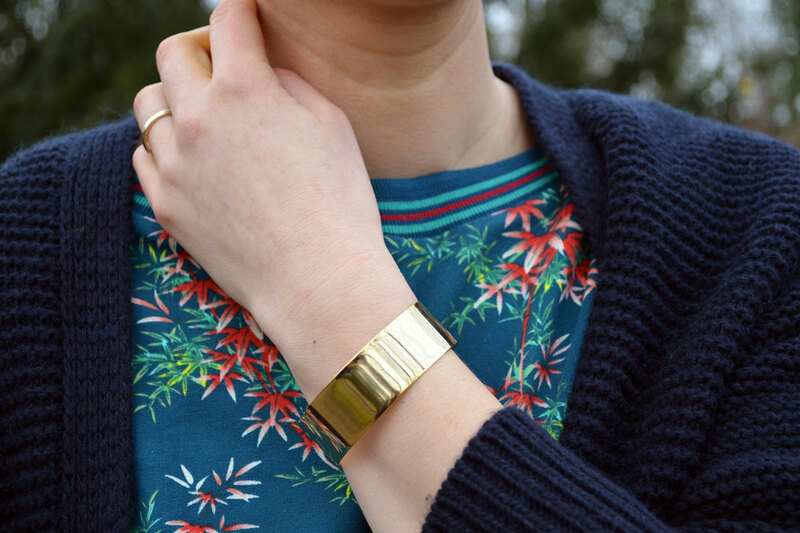 Find out more about NOUA Jewelery HERE and find the bracelet cuff I am wearing HERE. 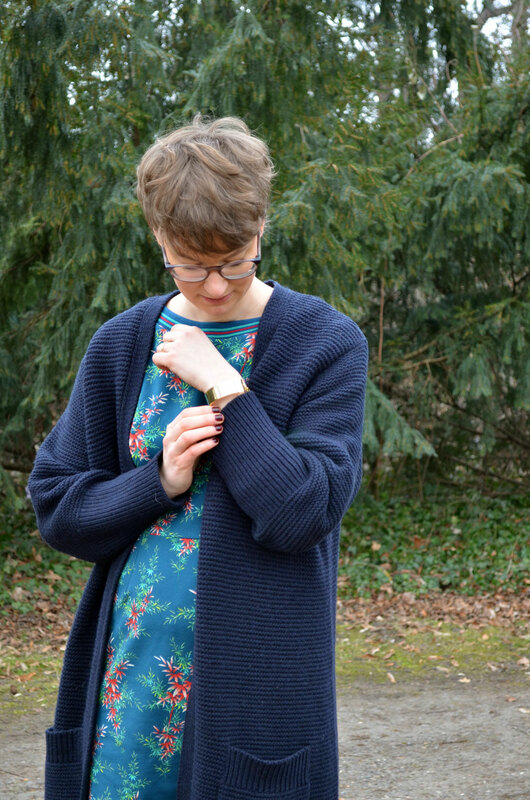 Now I would love to know how you like this outfit, the dress, the cardi, the bracelet!? Please leave me a comment in case you enjoyed this post!